The time-of-transaction building energy use disclosure program (commonly referred to as AB 1103) ended in 2015. The new statewide benchmarking program mandated by AB 802 will become effective in 2017. Fifteen cities, two states, and one county in the U.S. have passed laws requiring the benchmarking & disclosure of energy use in buildings. More governments look to follow their lead, expecting these policies to drive investment in efficiency. Phase I of the California HERS Program, which was adopted in 1999, established the basic operating framework of the program, including training and certification procedures for raters, quality assurance procedures, and data collecting and reporting requirements for raters who are performing field verification and diagnostic testing services for demonstrating compliance with Title 24 Building Energy Efficiency Standards. Phase II of the HERS Program extended the Phase I HERS Program to cover whole‐house home energy ratings of existing (and newly constructed) homes. Starting in 2009, electric and gas utilities shall maintain records of the ;energy consumption data of all nonresidential buildings to which they provide service. This data shall be maintained, in a format compatible for uploading to the United States Environmental Protection Agency’s Energy Star Portfolio Manager, for at least the most recent 12 months. Starting in 2009, upon the written authorization or secure electronic authorization of a nonresidential building owner or operator, an electric or gas utility shall upload all of the energy consumption data for the account specified for a building to the United States Environmental Protection Agency’s Energy Star Portfolio Manager in a manner that preserves the confidentiality of the customer. 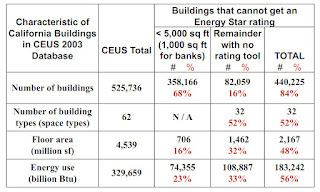 Starting in 2010, an owner or operator of a nonresidential building owner or operator shall disclose the United States Environmental Protection Agency’s Energy Star Portfolio Manager benchmarking data and ratings, for the most recent 12-month period, to a prospective buyer, lessee of the entire building, or lender that would finance the entire building. 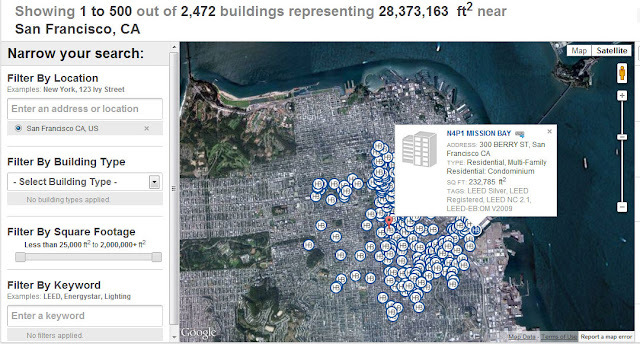 Cal-Arch - A building energy benchmarking database for California. 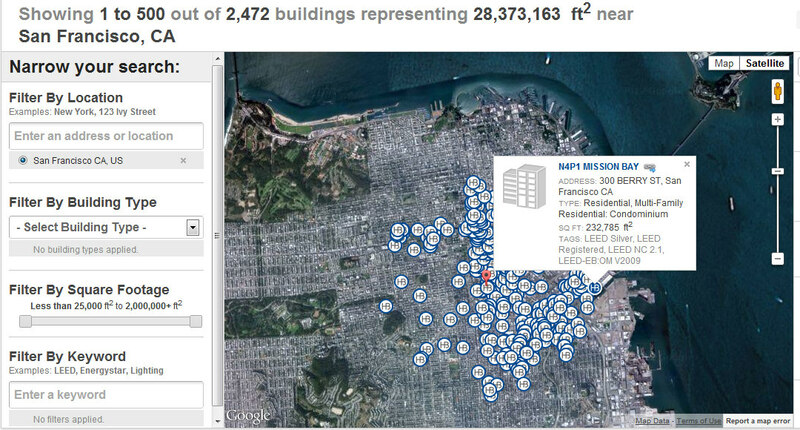 This web-based tool for benchmarking whole building energy for California commercial buildings was built in a three-year project which commenced in July 2000. An additional 15 months of development was funded beginning August 2003. Currently Cal-Arch uses existing survey data from California’s Commercial End Use Survey (CEUS), a largely underutilized wealth of information collected by California’s major utilities. Commercial Building Asset Rating Program - On August 8, 2011, the Department of Energy issued a "Request for Information" seeking input from stakeholders on a "Commercial Building Asset Rating Program" The goal of the program is to create an Energy Star-like system for commercial buildings. The program would establish common inputs for calculating energy efficiency, select a modeling tool to evaluate the inputs for individual buildings and output a rating with which to compare the energy efficiency of different buildings. The goal of the new program is primarily to address the issue of valuing energy efficiency by providing a common metric for comparing the energy efficiency of commercial properties, and providing a reliable and common system for evaluating commercial building energy efficiency. The devil is in the details, of course. The RFI proposes several different models for valuing energy, evaluating energy efficiency, and conveying the information. If the DOE program is created, the commerical real estate community could soon be using a 100 point scale, like LEED, or a star system like the Energy Guide labels on appliances. The robustness of the inputs and the energy model is critical to accurately evaluating building energy use, the simplicity of the input system will determine whether commercial building owners will use it to rate their facilities, and the representation of the "score" will determine whether users will actually understand and act on the information. DSM - Demand Side Management - In states where utilities are required to offer DSM Programs, utilities should petition the regulators to allow for the creation of a rebate program to subsidize the cost of the pre-sale energy audit. Having had experience with DSM Program design, this program would have to pass certain cost effectiveness tests, but the key to new DSM Program would be in creating the educational piece that would be a result the audit. E-Scale - EnergySmart Home Scale - Created in 2009 by the U.S. Department of Energy "based on" the HERS Index, apparently simply by subtracting the HERS Index from 100. In this new scale, higher values correspond again to better performance. ECM - Energy Conservation Measure - Any type of project conducted or technology implemented to reduce the consumption on energy in a building. These can come in a variety of forms: water, electricity and gas being the main three for industrial and commercial enterprises. The aim of an ECM should be to achieve a saving, reducing the amount of energy used by a particular process, technology or facility. ECMs are often implemented these are usually conducted by Energy Service Companies (ESCOs). EEM - Energy Efficiency Measure - A product or service designed to reduce energy consumption, use and/or increase the efficacy of said equipment when installed at the Customer’s Site. EER - Energy Efficiency Rating - The EER for air conditioners, which is the ratio of BTUs cooling per watt of power input based on specified test conditions. The higher the EER number, the more efficient the associated equipment. Energy Star -To earn the ENERGY STAR, a home must meet strict guidelines for energy efficiency set by the U.S. Environmental Protection Agency. These homes are at least 15% more energy efficient than homes built to the 2004 International Residential Code (IRC), and include additional energy-saving features that typically make them 20–30% more efficient than standard homes. Energy Star Home Performance Rating- The U.S. EPA's Energy Star program has developed energy performance rating systems for several commercial and institutional building types and manufacturing facilities. These ratings, on a scale of 1 to 100, provide a means for benchmarking the energy efficiency of specific buildings and industrial plants against the energy performance of similar facilities. The ratings are used by building and energy managers to evaluate the energy performance of existing buildings and industrial plants. The rating systems are also used by EPA to determine if a building or plant can qualify to earn Energy Star recognition. For many types of commercial buildings, you can enter energy information into EPA's free online tool, Portfolio Manager, and it will calculate a score for your building on a scale of 1-100. Buildings that score a 75 or greater may qualify for the ENERGY STAR. Portfolio Manager is an interactive energy management tool that allows you to track and assess energy and water consumption across your entire portfolio of buildings in a secure online environment. Whether you own, manage, or hold properties for investment, Portfolio Manager can help you set investment priorities, identify under-performing buildings, verify efficiency improvements, and receive EPA recognition for superior energy performance. EPS - Energy Performance Score - Developed by Energy Trust of Oregon, provides a clear and quantitative way to compare a home's energy use and costs. The lower the score, the better—with zero being the best. eQuest - Quick Energy Simulation Tool - A sophisticated, yet easy to use, freeware building energy use analysis tool that provides professional-level results with an affordable level of effort. eQUEST was designed to allow you to perform detailed comparative analysis of building designs and technologies by applying sophisticated building energy use simulation techniques but without requiring extensive experience in the "art" of building performance modeling. This is accomplished by combining schematic and design development building creation wizards, an energy efficiency measure (EEM) wizard and a graphical results display module with a complete up-to-date DOE-2 (version 2.2) building energy use simulation program. A building’s EUI is calculated by taking the total energy consumed in one year (measured in kBtu) and dividing it by the total floorspace of the building. For example, if a 50,000-square-foot school consumed 7,500,000 kBtu of energy last year, its EUI would be 150. A similarly sized school that consumed 9,000,000 kBtu of energy last year would have a higher EUI (180) to reflect its higher energy use. Generally, a low EUI signifies good energy performance. DOE-2 - A widely used and accepted freeware building energy analysis program that can predict the energy use and cost for all types of buildings. DOE-2 uses a description of the building layout, constructions, operating schedules, conditioning systems (lighting, HVAC, etc.) and utility rates provided by the user, along with weather data, to perform an hourly simulation of the building and to estimate utility bills. The “plain” DOE-2 program is a “DOS box” or “batch” program which requires substantial experience to learn to use effectively while offering researchers and experts significant flexibility; eQUEST is a complete interactive Windows implementation of the DOE-2 program with added wizards and graphic displays to aid in the use of DOE-2. HERS - Home Energy Rating Systems A process of administering diagnostic analysis to determine and produce data that provides a method of evaluation for a California State approved home energy efficiency ratings. This establishes a benchmark of a home's energy use and identifies necessary and/or best possible upgrades for homeowners. HERS Index - Ratings provide a relative energy use index called the HERS Index – a HERS Index of 100 represents the energy use of the “American Standard Building” and an Index of 0 (zero) indicates that the Proposed Building uses no net purchased energy (a Zero Energy Building). The lower the value, the better. Each 1-point decrease in the HERS Index corresponds to a 1% reduction in energy consumption compared to the HERS Reference Home. The earlier "HERS Score", which ran in the opposite direction: The higher the value, the better. IPMVP - International Performance Measurement and Verification Protocol - Defines standard terms and suggests best practise for quantifying the results of energy efficiency investments and increase investment in energy and water efficiency, demand management and renewable energy projects. The IPMVP was developed by a coalition of international organizations (led by the United States Department of Energy) starting in 1994-1995. The Protocol has become the national measurement and verification standard in the United States and many other countries, and has been translated into 10 languages. IPMVP is published in three volumes, most widely downloaded and translated is IPMVP Volume 1 Concepts and Options for Determining Energy and Water Savings. A major driving force was the need for a common protocol to verify savings claimed by Energy Service Companies (ESCO's) implementing Energy Conservation Measures (ECM). The protocol is a framework to determine water and energy savings associated with ECMs. IPMVP provides four Options for determining savings (A, B, C and D). The choice among the Options involves many considerations. The selection of an IPMVP Option is the decision of the designer of the M&V program for each project. Option (A) - Retrofit Isolation: Key Parameter Measurement - Savings are determined by field measurement of the key performance parameter(s) which define the energy use of the ECM affected system(s) and/or the success of the project. Parameters not selected for field measurement are estimated. Estimates can be based on historical data, manufacturer’s specifications, or engineering judgment. Documentation of the source or justification of the estimated parameter is required. Typical applications may include a lighting retrofit, where the power drawn can be monitored and hours of operation can be estimated. Option (B) Retrofit Isolation: All Parameter Measurement - Savings are determined by field measurement of all key performance parameters which define the energy use of the ECM-affected system. Typical applications my include a lighting retrofit where both power drawn and hours of operation are recorded. Option (C) Whole Facility - Savings are determined by measuring energy use at the whole facility or sub-facility level. This approach is likely to require a regression analysis or similar to account for independent variables such as outdoor air temperature, for example. Typical examples may include measurement of a facility where several ECMs have been implemented, or where the ECM is expected to affect all equipment in a facility. Option C uses utility bills to determine energy savings. Bills may be corrected for weather. Option (D) Calibrated Simulation - Savings are determined through simulation of the energy use of the whole facility, or of a sub-facility. Simulation routines are demonstrated to adequately model actual energy performance measured in the facility. This Option usually requires considerable skill in calibrated simulation. This option is rarely used, and is used primarily when thereis no pre-retrofit utility data available. There are many situations where Option A or Option B (Metering and Calculating) is the best approach to measuring energy savings, however, some ESCOs insist upon only using Option A or Option B, when clearly Option C would be most appropriate. If the ESCO was a lighting contractor, then Option A should work in all cases. Spot measurements of fixtures before and after, agreed upon hours of operation, and simple calculations can be inserted into a spreadsheet that can calculate savings. The same spreadsheet can be used over and over. However, for ESCOs that offer a variety of different retrofits, it is necessary to be able to employ all options so that the best option can be selected for each individual job. Controls Retrofits, or retrofits to HVAC systems are typically excellent candidates for Option C .
M&V - Measurement and Verification - The term given to the process for quantifying savings delivered by an Energy Conservation Measure (ECM), as well as the sub-sector of the energy industry involved with this practice. M&V demonstrates how much energy the ECM has avoided using, rather than the total cost saved. The latter can be affected by many factors, such as energy prices. The M&V process enables the energy savings delivered by the ECM to be isolated and fairly evaluated. A key part of the process is the development of an ‘M&V Plan’, which defines how the savings analysis will be conducted before the ECM is implemented. This provides a degree of objectivity that is absent if the savings are simply evaluated after implementation. TDV - Time Dependent Valued - Energy means the time varying energy used by the building to determine the home energy rating pursuant to these regulations. TDV Energy accounts for the energy used at the building site and consumed in producing and delivering energy to a site, including, but not limited to, power generation, and transmission and distribution losses. 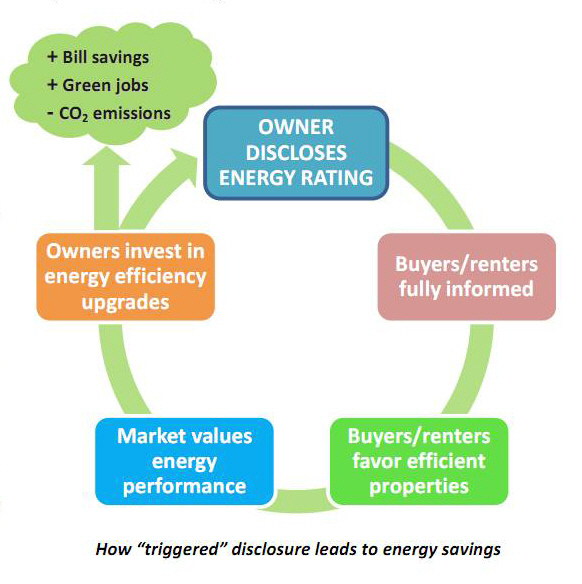 Time of Sale Triggers - When selling a home or building, owners must disclose a valid energy rating to potential buyers. The rating indicates current performance and potential improvements, providing meaningful information to consumers and empowering them to consider energy performance in their decisionmaking. Armed with information, some consumers will give preference to more energy efficient homes, enabling markets to value energy performance, and providing a greater return on investment to projects aimed at improving building energy performance. Time of Rental Triggers - The same process applies at the time of rental (this requirement may be phased in at a subsequent stage). Scheduled Disclosure (Operations) - Commercial building owners must obtain a simplified, standardized rating, indicating their annual “operating” performance. This enables owners and building managers to measure their performance annually, to institute continuous improvement practices, to benchmark against other buildings (within or outside of their own fleet), and to establish performance targets in their annual plans and objectives. Policies can also require that ratings be displayed in prominent locations within the building or published in a publicly-available database. First adopted over a decade ago in Australia and Denmark, mandatory building energy rating policies are now in place in more than 30 countries worldwide. They are also increasingly being considered, adopted or implemented in the U.S., in states like California, Nevada, Washington, Oregon and New Mexico, and in cities like Austin, New York and Washington, D.C. Indeed, the past year has seen a flurry of activity around this policy opportunity in the U.S., including landmark legislation currently being debated in both houses of Congress. Education - The home buyer is more educated about what they are actually buying. The utility bill represents a substantial cost every month and this can very greatly from house to house depending on how "tight" the house is. Buyer Cost Savings - If a new home buyer doesn't have an energy audit or any report about the current condition of the building they could be looking at $5-10K in renovations on top of the asking price. Realtors can recommend during inspection to have this done and the current owner either fixes the leaks or reduces the price. Green Jobs - Auditing creates a new business sector - could be a good thing for those seeking employment. We will collect lots of data but after the audits are completed submitted what happens. Is there a plan to take action on the results and actually do something? Audit Bottlenecks - Commercial building energy efficiency evaluation is currently a slow, expensive, and non standard process. Building professionals spend countless hours walking around buildings, benchmarking and researching efficiency solutions, and generating detailed reports. With more than 5 million buildings and 80 billion square feet, there aren’t enough auditors, consultants, and engineers to put a real dent in the problem. This is creating a huge bottleneck and preventing the problem from being tackled in a systematic and scalable way. Bureaucracy - All it does is add another $1,000 or more to the cost of selling a house on top of all the other fees. It's just another piece of bureaucracy imposed by government. Cost - The cost (HERS ratings are $500 - $1500, audits are a $200-$500), the burden, and the unregulated nature of the auditing market. Lack of Standards - There is no standard to perform an energy audit. LEED, Green Globes, Energy Star, ..ect. have excellent criteria, but they are not standards such as entitlements or building codes. Gaps in Energy Star coverage - Only 44% of California Commercial buildings can qualify for an Energy Star rating. Split Incentive - Owners don’t make efficiency investments because it’s the renters who pay the energy bills. And renters don’t make investments in property they don’t own. The result is housing that wastes energy and costs more than it should. One solution takes advantage of the lease or rental agreement: “green leases” enable owners to spend money on efficiency improvements and recoup their costs by raising rent by the same amount as the realized energy savings, minus a smaller agreed on amount which gets passed on to the renter. In other words, if an efficiency investment to the renter’s unit generates $100 of monthly energy savings, the rent might go up $80 per month. Although the rent increases, the tenant’s total housing bill goes down by $20. It’s a win for both parties. The tenant would start saving money right away, and over time the landlord would recoup his initial investment (and even make money), through the higher rents. Unregulated Loads - Currently, no standard process exists to evaluate “unregulated loads” in buildings such as plug loads, commercial refrigeration and vertical transportation. In fact, energy models created for the purposes of code compliance often fail to account for such unregulated loads altogether, resulting in significant discrepancies between the predicted and actual energy use of a building. Automatic Reference Building Generation - To rate the efficiency of an actual subject building, energy modelers frequently construct energy models of “reference buildings” -- hypothetical buildings identical in many respects to the subject buildings. The modeler then compares the energy consumption of the subject building to code-compliant baseline and often expresses the result for the subject building as “x% better or worse than code.” Currently most energy modeling software cannot automatically generate reference buildings. COMNET will help existing modeling software to add the ability to automatically generate multiple reference buildings corresponding to multiple efficiency standards. New auditing software packages are coming online to reduce the cost, improve the modeling, and provide better information to the client. The market is evolving and becoming more uniform due to the growth and focus on home energy efficiency. Real-time integration and visibility of building management systems, metering subsystems, and asset management applications. Automated, real-time analysis and reporting of key performance indicators associated with subsystem operations, energy use, and equipment maintenance management. Recommendations for results-oriented energy usage and maintenance program refinements that will enable energy reduction targets to be met or exceeded. On-going monitoring of subsystems to continually expand energy conservation efforts and maintenance management improvements for further cost reductions. Independent verification of ESCO and other Energy Conservation Measures (ECM) programs. Information must be credible, reliable, and replicable. Information must be transparent and easy to understand. Opportunities identified must be relevant and practical. Program must include effective quality assurance. 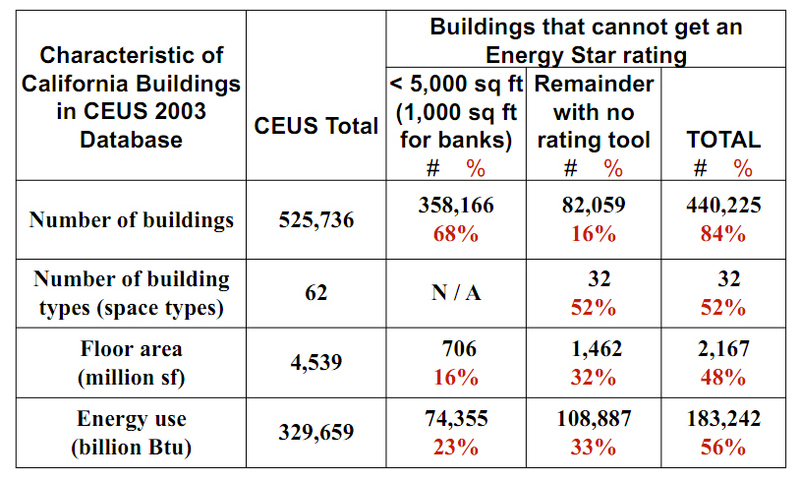 Rating must recognize building energy performance across the full range of building efficiency. Seattle, which aims to reduce energy use 20% by 2020, opted for mandatory energy efficiency reporting. 860 buildings with more than 50,000 square feet must report by Oct 1, 2011 and another 8,000 buildings with more than 10,000 square feet by Apr 1, 2012. Aug 1, 2011 was the deadline for 16,000 large buildings in New York City— representing half of its interior space — to report how much energy they used in the past year or face $500 quarterly fines. The city will post the data on a public website next year. Energy Efficiency Reporting will be required in San Francisco starting in October 2011, Click here to see the ordinance. 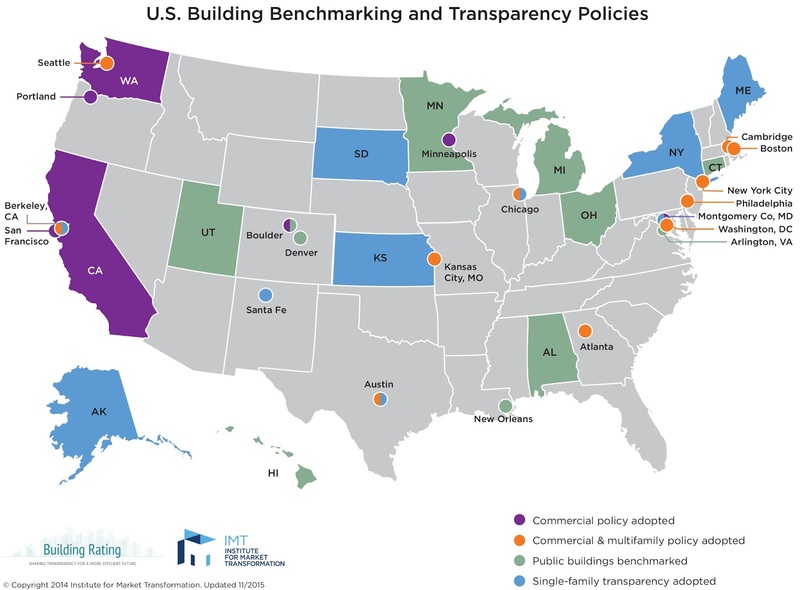 In Washington DC, the new ENERGY STAR® benchmarking requirements of the Green Building Act for commercial buildings over 200,000 sf took effect July 1, 2011. However, because building owners will need the additional guidance and tools provided by District Dept of the Environment'S (DDOE's) forthcoming regulation, they will not be required to submit data until the rulemaking process is complete. For example, neither the final list of data points that must be entered into the ENERGY STAR® Portfolio Manager tool or the on-line reporting template for submitting data to DDOE will be available until the rule is final. DDOE continues to move the draft regulation through the approval process and anticipates publishing the draft regulations in early July for a 30-day public comment period. DDOE does not have a specific effective date for the final rule, but anticipates an effective date in October. This would include the 30-day comment period, time to make any necessary modifications, and the DC Council review period of up to 45 days. Energy Foundation - San Francisco - A partnership of major donors interested in solving the world's energy problems. It's mission is to advance energy efficiency and renewable energy — new technologies that are essential components of a clean energy future. CalCERTS - Folsom, CA - Approved by the California Energy Commission in 2003 to become a Home Energy Rating System (HERS) Provider. CalCERTS, Inc. is a private organization that provides service, support, training and certification to HERS raters. HERS raters are independent contractors who are either independently operated or who sub-contract to larger energy rating firms. Raters charge their customers for site ratings and pay a fee to CalCERTS, Inc. for processing the ratings and issuing certification. CalCERTS, Inc. has developed and owns its own software which is approved by the California Energy Commission and is utilized by the HERS rater to enter rating data. CalCERTS, Inc. maintains the computer based registry of data as a repository of information that can be accessed by the HERS rater, building departments, contractors and government agencies. CBPCA - California Building Performance Contractors Association -A non-profit organization dedicated to reducing the energy demands in California and developing industry leaders in the burgeoning field of building energy efficiency. CBPCA is one of three HERS Providers licensed by the California Energy Commission to train, test, manage and audit building energy efficiency professionals including:Field Verification and Diagnostic Testing Raters for alterations only. CHEERS - California Home Energy Efficiency Rating System - In consultation with the California Energy Commission, CHEERS has decided to stop accepting new projects that are subject to the 2008 California Building Energy Efficiency Standards, effective at midnight, October 15, 2010. CHEERS is taking this action because it is not in compliance with the August 2009 Home Energy Rating System (HERS) Regulations for data registry requirements. It is working with new software developers on a fast track to improve both the CHEERS registry and database so that they are fully in compliance with the HERS regulations. The California Energy Commission will review and approve the registry and database before CHEERS will restart accepting new projects. FirstFuel - Lexington, Mass Founded in 2010 and privately held, - Provides "behind-the-meter intelligence for the utility without them having to go behind the meter. The firm does this without on-site audits or connectivity to building systems. It helps utilities engage their commercial customers and deliver energy efficiency across commercial building portfolios. The FirstFuel Rapid Building Assessment platform uses advanced analytics to remotely benchmark building energy performance, creating rich energy profiles that eliminate the need for costly and inconsistent on-site energy assessments. FirstFuel closed a $2.4 million round from Battery Ventures and Nth Power for its business of analyzing the energy patterns of commercial buildings in September 2011. In February 2012, the firm closed a $10 million round A led by new investor Rockport Capital. Investors like their process because it's this non-intrusive, touchless process that allows the firm to scale. First Fuel's customers are utilities providing energy efficiency programs, not the building owners themselves. U.S. utilities spent about $6.6 billion on marketing energy efficiency to customers and encouraging them to invest in it through rebates and rate schemes in 2010, according to the Consortium for Energy Efficiency. That total is projected to grow to $12 billion in 2015. But that money still tends to be spent using a shotgun approach, with mass mailings, cold calls and energy-use surveys that require a lot of filtering to find the best targets. Honest Buildings - New York, Seattle - Honest Buildings has created a profile for any building in the world with an address. This platform is the first place that connects occupants, service providers and owners to each other and the buildings where they live, work and spend their time. Type in an address, and the free service instantly finds information about any commercial or residential building in the U.S., including pictures, reviews, Honesty Ratings(TM), open and completed projects, and the people associated with that building, including service providers, managers and owners. Anyone can use Honest Buildings to compare buildings based on size, location, type, Honesty Ratings, associated organizations, and the types of projects that have been completed, helping them to make better-informed decisions about real estate. RESNET - Residential Energy Services Network - Founded in April 1995 by the National Association of State Energy Officials and Energy Rated Homes of America to develop a national market for home energy rating systems and energy efficient mortgages. RESNET's standards are officially recognized by the federal government for verification of building energy performance for such programs as federal tax incentives, the Environmental Protection Agency's ENERGY STAR program and the U.S. Department of Energy's Building America Program. RESNET standards are also recognized by the U.S. mortgage industry for capitalizing a building's energy performance in the mortgage loan, and certification of "White Tags" for private financial investor. Retroficiency - Boston startup out of MIT - Retroficiency’s Software-as-a-Service (Saas) platform is designed to replace a lot of the manual and time-intensive work that energy services companies (ESCOs) and property owners must go through today to plan and execute efficiency retrofits. Retroficiency’s software aims to cut those costs by delving through tens of thousands of pieces of data to compare potential retrofit target buildings to others of the same square footage, age of construction, use and occupancy patterns and reams of similar data. The end result is a “very accurate characterization” of each building’s energy use, typically within 3 percent accuracy. That can help narrow down which buildings are fruitful targets for energy savings, vs those that won’t offer as much payback. Their Building Efficiency Intelligence™ (BEI) software platform offers two solutions - Virtual Energy Assessment™ and Automated Energy Audit™ - that deliver rapid identification of commercial buildings with high potential for energy savings and cost-effective evaluation of efficiency measures. These solutions enable energy services providers, utilities and building owners to be more effective, beginning with the sales and opportunity identification process through making final operational and system retrofit energy efficiency recommendations. SkyFoundry - Glen Allen, Virginia - Provides software that captures data on wasted energy data from buildings with or without instrumentation, and feed it to facilities managers in an easy-to-understand format, he said. Partners have applied the software to about 1,000 buildings, at levels ranging from shallow benchmarking and analysis to “very deep” continuous commissioning fully tied into building equipment and sensors. SkyFoundry digs into multiple sources of data -- BMS data, sensor and control data, real estate records and occupancy figures, weather reports and the like -- and feeds that data into an analytics engine to figure out a building’s optimal energy usage and where it’s deviating from the norm. Return on investment can range from months to years, depending on how quickly building owners decide to tackle their challenges, but SkyFoundry’s partners would be the ones responsible for picking and choosing which retrofit projects to take on. Energy Star Building Certifications - Save on Energy, Plano, TX - Lots of interesting infographics. Energy Auditor Talk - An energy auditing forum for weatherization professionals who want to stay up to date and take advantage of new green building practices. NASCO - National Association of Energy Service Companies is a national trade association which has been promoting the benefits of the widespread use of energy efficiency for over 25 years. Thanks for this incredible resource on the energy audit. This is quite timely too for the said energy efficient tax cuts. Are they able to come up with a good solution to this matter? Energy efficiency is the key for all of us to save money.